A few days ago we shared a behind the scenes image of Jason Voorhees stalking about the makeshift camp site of Rob Dier from Friday the 13th: The Final Chapter. The image was released by Crash Cunningham, who has a wide variety of these type of stills from all of the Friday the 13th films. Today he released more pics from The Final Chapter and Jason has a few admirers. 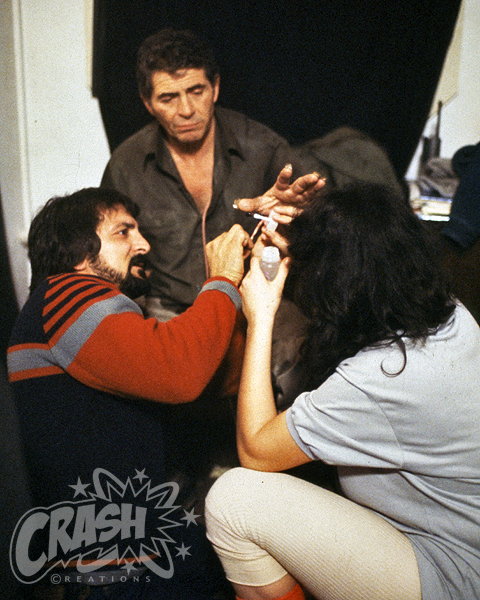 The first photo shows Tom Savini and an assistant working on Jason Voorhees actor Ted White's hand make-up. There was actually a decent amount of time used towards giving Jason very realistic looking hands for a killer that lived in the woods. He had some nasty looking finger nails in the film for sure! The second pic has actor Bruce Mahler (Axel) getting into frame with the make-up appliance of Jason. 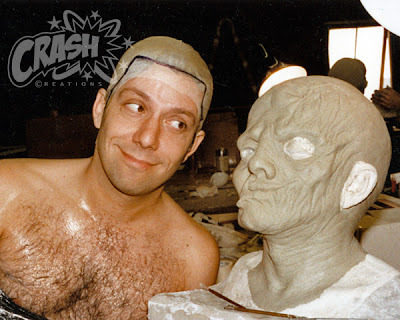 Bruce himself looks to be preparing for a headcast to be made for his brutal death scene in the hospital morgue.